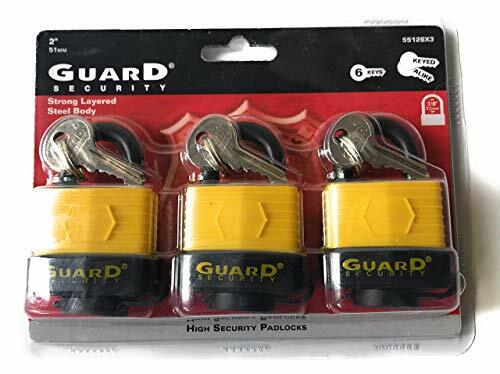 This is a set of 3 Guard Security brand high security padlocks. These are 2-inch size padlocks with 6 keyed alike matching keys, meaning that all of the keys work with each of the 3 padlocks. These locks feature a strong layered steel body precision engineered to resist forced entry. There is also a lifetime guarantee on these available thru the manufacturer. This is a great set that can be used for multiple aspects of keeping things secured. GREAT VALUE: Set of 3 high security padlocks with matching keys (all keys can be used on the locks). QUALITY: precision engineered 2 inch laminated padlocks to resist forced entry. LIFETIME GUARANTEE: manufacturer lifetime guarantee! Great way to protect various things in your life whether it be storage units/sheds, garage doors, and any other area you want to protect. EXTRA KEYS: 6 Keys are included and they all work on all the locks! If you have any questions about this product by Guard Security, contact us by completing and submitting the form below. If you are looking for a specif part number, please include it with your message.